Missing out on cardiovascular device in vitro testing applications and tips? Are you missing out on these cardiovascular device in vitro testing applications and tips? There are numerous reasons for in vitro testing for regulatory submission, but non-regulatory benefits are also important. Often overlooked are Accelerated Durability Testing and Controlled Environment. Cardiovascular devices are typically placed around a beating heart or in a pulsatile flow environment. As a result cyclic loading is always applied to these devices creating the risk of a potential failure mechanism. Computational models can be useful in designing for fatigue but before a device is ever implanted in a patient, it must go through physical life cycle testing. The fastest way to get physical life cycle results is to accelerate them in a laboratory setting, something impossible to do with animals. 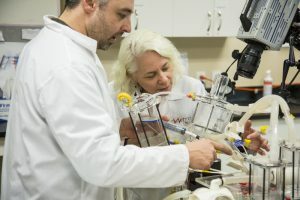 Using in vitro techniques and ViVitro equipment, we are able to put a device through millions of cycles in a single day, something that would take almost a month in an animal. Many cardiovascular device companies have durability testing on their long list of things to accomplish before they call their design “finished”. It is often left until too late in the design process. Companies will come to us with what they feel is a finalized design and are simply expecting to check the durability box on their device submission only to find out too late that they have a serious design flaw. Durability tests can be lengthy and are perceived as expensive undertakings. Our service options make it possible for companies to put prototypes through their paces early in the design process, preventing costly surprises when the finish line looks to be in sight. Often the most conclusive way of determining whether a device iteration will be a success is to conduct a controlled in vitro test. With the exception of mandatory testing requirements to validate a design for regulatory approval, most device companies use in vitro to test a specific change in their device design. The beauty of bench top testing is to simplify the problem down to a set of variables which can be controlled or altered in an exacting manner. We often customize tests for device companies interested in a unique aspect of their design. We also create test protocols used in numerous different cardiac devices. 1) Test early – Contact an in vitro service or equipment vendor early in the design process to understand how they can help at all stages of your design. This will accelerate your design process and prevent costly late stage design changes. 2) Simplify – Bench top testing allows designers to simplify a complex system down to a bare minimum of components to understand individual aspects of a device’s design. Our team are experts at justifying the simplifications needed to test different aspects of a device design.